Netting a playoff spot in 2009-10 appeared to be a long-shot at best for the Phoenix Coyotes. And while the push for a post-season berth is only just beginning, Ilya Bryzgalov is already at the top of his game. Having never made it out of the first round of the playoffs, the odds appeared stacked against the Coyotes making it to the final eight in the Western Conference this season. Add the fact that the franchise has not won a playoff series since 1987, when it was still in Winnipeg, and the closest they have come to advancing past the first round was during the 1999 playoffs, when they lost a heartbreaking Game 7 to the St. Louis Blues. History, as it were, is not exactly on the Coyotes side. But a hard-working cast, led by captain Shane Doan, has given the fans in Phoenix a reason to believe that the pieces are in place to not only secure a playoff spot, but also to make some noise once the puck drops when the battle for the Stanley Cup begins. Though there are any number of reasons as to why the Coyotes have enjoyed a strong campaign, there's no doubt the man between the pipes has been a huge factor in their success story. Drafted 44th overall by the Anaheim Ducks in 2000, Bryzgalov is enjoying his most accomplished NHL season to date, having already surpassed his previous career-best win and shutout totals. He is the first Phoenix goalie with 30 wins in a season since Curtis Joseph had 32 in the 2005-06 season. How did the Coyotes No.1 netminder get to this point? Bryzgalov, who made his NHL debut in 2001–02, took over behind Jean-Sebastien Giguère in the 2005–06 season. 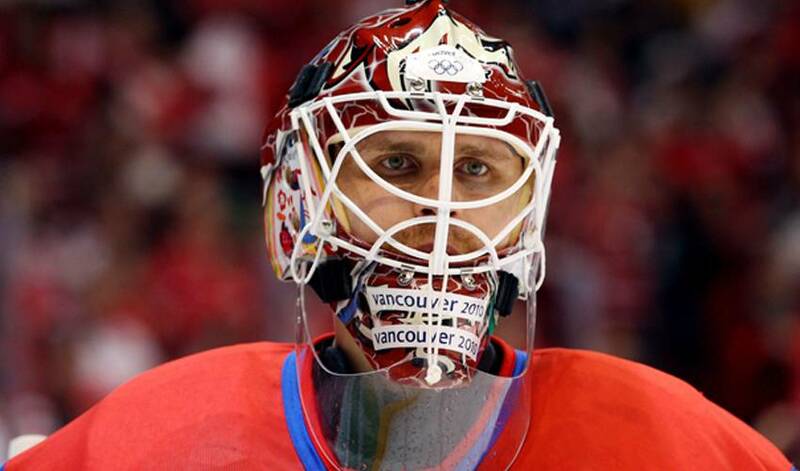 However, injuries to the Ducks starter allowed Bryzgalov to play more games. He responded with a 13-12-1 record accompanied by a 2.51 goals against average and .910 save percentage. In the playoffs, Bryzgalov made three starts and one relief appearance for the Ducks in their first-round series against the Calgary Flames. In Game 1, he filled in for an injured Giguère, a 2–1 overtime loss. He relieved Giguère once more in Game 5 and stopped all 19 shots he faced in a 3–2 loss. He then took over the starting job for Games 6 and 7 of the series, winning 2–1 in Game 6 and recording a shutout in the decisive Game 7. Bryzgalov then recorded 5–0 and 3–0 shutouts in the first two games of Anaheim's series against the Colorado Avalanche to give him three consecutive blankings. He tied Frank McCool's 1945 playoff record for most consecutive shutouts by a rookie and passed Giguère, who had recorded consecutive shutouts in 2003 for the third longest playoff shutout streak of all-time. He continued in the role of backup to Giguere the following season and into the 2007 playoffs, where the Ducks won their first Stanley Cup. Though he had proved he was capable of taking on a more prominent role, Bryzgalov was placed on waivers on November 16, 2007. The Coyotes wasted little time in seizing the opportunity to land the backstopper, signing him the following day. In his first game with the Coyotes, the same day he signed, Bryzgalov made 27 saves in a 1–0 win over the Los Angeles Kings. Phoenix then signed him to a three-year contract extension as he established himshe doesn't like to be scored on in any situation, including practice and pre-game warm-ups. Something Bryzgalov believes is not only good for him, but also for his teammates. Ready, some will say, to be a main player in the Coyotes quest to be a Cup contender.